I am based in Tirau and am able to trim at various locations throughout the Waikato, Tauranga and Rotorua. Feel free to give me a call on (07) 883 1022 or email me at centuryparkranui@gmail.com. This idea is what led me, (Carmen Petersen) into holistic care and lifestyle for my own horses. 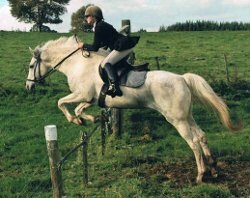 After many years of conventional boarding, and caring for my competition horses, I found it very hard to get them sound past the age of 12. The big elastic movement I started with, ended up being very ordinary; and although I hate to admit it, like a sewing machine. The horse's attitude went from a keen eagerness of "what do you want me to do next?" to "make me!". Eleven years ago, I started my big journey down the holistic path. I was researching different surfaces for an arena my husband and I were going to build. I wanted the surface with the best shock absorption to attempt to keep my horses joints and limbs as sound as I could, for as long as I could. This in turn got me thinking of the shock absorption my horses' hooves and limbs were obtaining. I started thinking that the metal shoe I was nailing to the bottom of my horses' hooves is one of the most concussive materials around. It was like a light bulb coming on that could not, and has not been switched off. I started reading about holistic care, and came across Dr Hiltrud Strasser's books. I have since read and studied every book she has written, along with any other book I could find on the subject. I was always interested in horses' hooves, and from an early age shod my own horses. 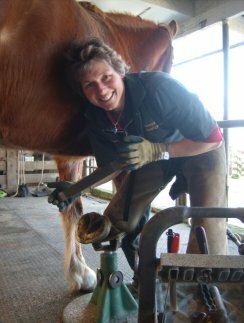 I worked with a master farrier for a year, learning the basics of shoeing. I was lucky enough to be able to start the Strasser Hoof Care Course in 2007 and graduated in November 2009. Since then I have been able to rehabilitate numerous lame horses diagnosed with founder or navicular disease. I now have a large number of high performance horses on my books. The key to being able to rehabilitate pathologically deformed hooves, is understanding how a healthy, anatomically correct, functioning hoof works. A functioning hoof plays a big part in the soundness of the lower limbs in horses. Correctly functioning hooves land heel first (full fetlock landing), break over at the toe and expand on weight bearing. If you have all of these things working properly, you have correct shock absorption, bone alignment, and a healthy heart that is supported by the blood pumping action happening with each step. Unsoundness within the hoof is simply incorrect mechanical forces. There really is nothing mystical about hoof soundness; it's logical. We need to eliminate cordial pain (heel pain) to create heel first landing, and make sure the hoof is balanced laterally as well as having a correct break over. Add a correct lifestyle and you have all the ingredients for a happy sound horse. I thought it would be good to give you some info/history on Lucy's horse. She has been barefoot for 6 years now. I have been trimming her for the last year, before that she was being trimmed by her previous owner, who had done a Strasser weekend course. She is eleven years old and this is her first hunt season. She went full wire after three hunts. Last year I took her out for two hunts but her feet were not a correct form and I found she slipped and had no traction. This year I have found her to be very sure footed in all weather conditions.